Perhaps the quote explains Mona Lisa’s mysterious smile. Maybe she adopted her creator’s philosophy and practiced yoga! To clarify, the PAL&G backyard boasts a 3-tiered meditation garden and a Chartres Cathedral inspired labyrinth. (Sometimes called a Moving Meditation.) By day, the labyrinth is carpeted with those contemplating life. On the evening of August 21st, yoga mats will crisscross the labyrinth. My interview with Jennifer about yoga and life follows. Q: What forms of yoga do you practice? JH: I practice and teach a combination of hatha and vinyasa that is also heavily influenced by Iynengar. What this means is that I slowly build my practice from the ground up consciously awakening the body, holding in postures and linking breath to movement. I am not a power yoga teacher. I can enjoy those classes from time to time and I have found that my peace is in the slow build. 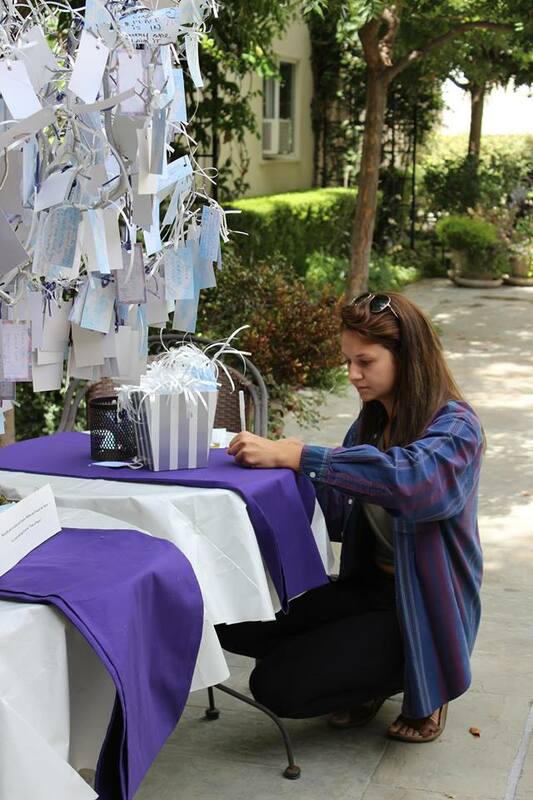 Q: What can you guarantee or almost guarantee students will walk away with after Yoga at the Labyrinth? JH: All willing and open participants will absolutely walk away with an experiential reference of peace within themselves and their bodies. JH: I practice 3-5 times a week and sometimes that is a 20 minute evening restorative practice. Q: What’s the greatest gift you’ve received from yoga? Healing the relationship with my body. Through my practice of yoga, learning about and feeling into parts of my body I never had prior, I began to relate to my body as an apprentice. Instead of constantly evaluating it externally, I began to steep in the wonder of its miraculous nature. I am so grateful for this new context, awareness and healing. Q: Advice for the inflexible or stiff jointed? JH: Gentleness - with your body and with your mind. The physical practice of yoga is really a distraction to reduce the noise of the mind. Yoga is not about flexibility. That is a misnomer. Actually bodies that are very flexible or hyper-mobile can injure themselves if they don't know how to back off. I begin almost every day feeling a bit stiff and inflexible. Yoga has actually supported me in better listening to my body so I know how to gently wake it up and support blood circulation to the joints, ligaments, tendons and muscles. Whenever possible use props during your practice. A simple blanket or thick towel can make all the difference. Q: What’s been the greatest challenge in practicing yoga? How do you or did you overcome that? JH: Growing my patience and learning to quiet the mind. There are metaphorical opportunities arriving all throughout a yoga practice if we are open to them. For example, how we relate to ourselves and the world while on our mat is a reflection of how we relate to ourselves and the world off the mat. Allowing that to be okay rather than a space to judge ourselves is when the practice takes on a whole new level of growth and expansion. Although the practice of yoga can be and feel rather serious, it's so important not to take ourselves too seriously. When we can loosen up and allow for the space our practice deepens. When I have tried to force a posture that my body is rejecting but my mind is attached to "doing," I struggle and get uptight. When I heed my body's communication and back off, I soften and relax. These two paths of relating impact my entire practice and often what occurs after. Over time, I have learned to leave it all on my mat, to use the entire experience to let it all go. It's literally my physical therapy, spiritual practice and self-care all in one. I am never sorry I did yoga. Q: Who’s been your biggest influence, inspiration in yoga? JH: My teachers. The first one was a woman I began practicing with around 2008 in Manhattan. Her classes were like mini-workshops. I didn't know that at the time and she has been the single biggest influence on my practice and my teaching approach. She weaved in depth and breadth into every 75 minute class and I found the teacher in me by being her student. They say, “When the student is ready the teacher arrives.” I am so grateful. Q: Besides, Peace Awareness Labyrinth & Gardens, where is the most exquisite place you’ve done yoga? JH: In the lush forest of a small town in the south west part of France. Just me and nature. It was Heaven on earth. Curious novice or consummate yogi, you are welcome to enjoy Yoga at the Labyrinth at 7:30 pm on Tuesday, November 6 on the heavenly grounds of PAL&G. Visit http://www.peacelabyrinth.org/events/yitm110618. Wear comfy clothes. And remember your yoga mats! Blankets and large beach towels work, too. Paul Kaye, Meditation Instructor and Soundscape Artist. Hop into a candlelit bubble bath. Sooth tension-weary muscles with a massage. Gaze up at a night sky sparkling with stars. All of the above works wonders. And so does meditation. Imagine soaking in sounds of serenity from faraway lands. Visualize an expert guide leading you through the chambers of your heart. Feel yourself shimmering in Light. This is not fantasy. 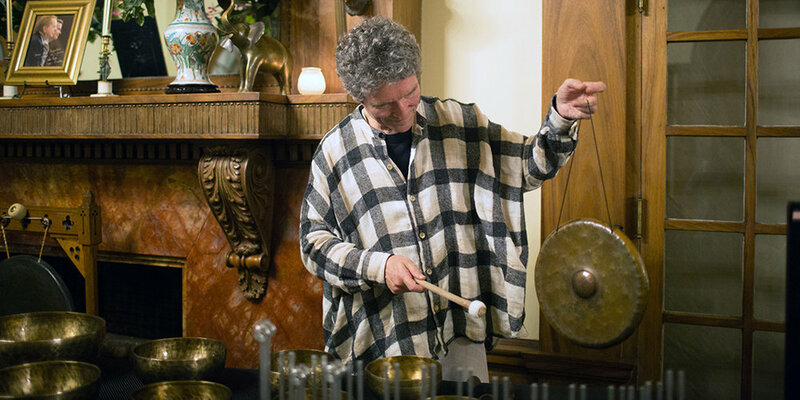 Paul Kaye’s Sound Bath at Peace Awareness Labyrinth & Gardens (PAL&G) embraces methods for de-stressing. You may hear instruments from the Himalayas and Japan echoing through a historic mansion. Riding atop the waves of harmony is the gentle voice of Paul. A teacher of forty years, he guides participants into a deep-dive meditation. Falling in love and meditation are similar. Both are highly personal and individual. Yet, we all agree it can be a fabulous experience. Dating for most is about finding "the right one." It takes time. So does discovering the method(s) of meditation that work best for you. Of course (and thank God! ), miracles can happen and some immediately experience their soul sing joy. Yet, like all relationships and practices, improvement is always welcome, right? Experience an Introduction to Meditation and Sound, A Deeper Experience evening at Peace Awareness Labyrinth & Gardens. Tell Me More | Save Me a Seat!